Escandalo, undera hand ride by jockey Eddie Sanchez, scores the fastest time from 14 training races on Friday at Louisiana Downs for Mardi Gras Futurity(RG2) hopefuls. 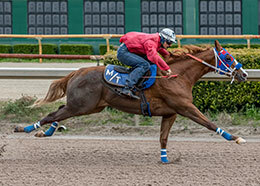 BOSSIER CITY, LA—FEBRUARY 1, 2019—The highly anticipated official debut of this year's 2-year-old crop took another step closer on Friday when Louisiana Downs hosted 14 training races for state-bred juveniles who remain eligible for trials later this month for the $250,000 Mardi Gras Futurity(G1). 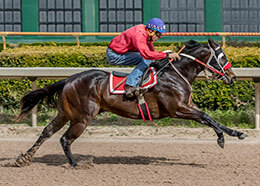 AQHA Racing Champion 3-Year-Old and first-crop sire Apollitical Blood had two winners from his four starters including Escandalo who completed the 220 yards in :12.262 seconds in the Race 2. Under jockey Eddie Sanchez the bay filly got up over Eyesa Jettin by three-quarters. Trainer Arthur Davilla III saddled the Louisiana-bred filly, out of Eyeing Miss Perry by Mr Jess Perry, for owner/breeder Delfino Lozano IV. Escandalo is a half-sister to Sam Houston Futurity(G1) finalist Mighty Zapa. The second dam is the grade 2 winning and multiple graded stakes producing Mr Eye Opener mare Louisiana Eye Opener. Tahar, under jockey Eddie Sanchez, gets the second fastest time in the Race 8 on Friday. Eyesa Jettin held on to the third fastest time of :12.369 seconds for owner Adame Racing LLC and trainer Michael Taylor. Antonio Alberto was aboard the $19,000 LQHBA Yearling repurchase by leading sire Jet Black Patriot from the Tres Fortunes mare Jumpn To A Fortune. Davilla III also saddled the second fastest winner on Friday, Tahar, a son of leading sire Heza Fast Dash owned by Emmanuel Villarreal. Also ridden by Sanchez, Tahar completed his 220 yard test in :12.349 seconds, defeating Td Jet Black Down by three-quarters. He is out of the Louisiana Champions Day Juvenile (RG2) winner The Game Cartel by Game Patriot. Jet Black Patriot's Jetn Smoothn was an impressive 2-¼ length winner in Race 4 to secure the fourth fastest clocking of :12.382 seconds. Eliseo Celestino conditions the filly out of What Smooth Dash for owner Richard Mendoza. 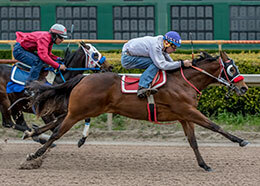 Jetn Smoothn, under jockey Martin Trujillo, Sr., won the Race 4 by 2-1/4 lengths. Second-crop sire Ajs Fast Dash, Heza Fast Dash, Sir Runaway Dash and Jet Black Patriot joined Apollitical Blood with duel race winners on Friday's card. Last year's leading juvenile sire Five Bar Cartel, first-crop sire Heza Fast Rogue, Jess Louisiana Blue and Outlaws And Inlaws each sired a winner on the Mardi Gras training card. Davilla III led all trainers with three winners on Friday. Wendy Garcia had two. Eddie Sanchez rode three winners and Modesta Pina had two on the day. For a complete list of 2-year-olds with individual times and finishes from today's training races CLICK HERE. Next Friday, February 8, Louisiana Downs will host another round of training races for 2-year-olds who remain eligible for the $250,000-est. Harrah's Entertainment Futurity. Trainers must contact the racing office before Monday (Feb. 4) to enter.